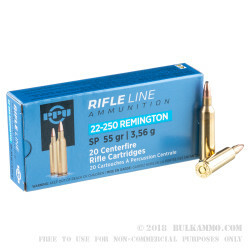 This 22-250 Rem cartridge by Prvi Partizan features a 55 grain projectile, which is squarely in the middle range of bullet weights for this caliber. 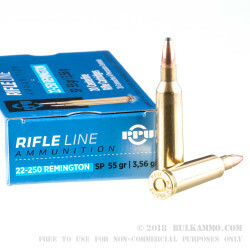 It is a soft point projectile, which is popular among long-range shooting enthusiasts for the devastation it inflicts similar to that of a hollow point but sans the scooped out tip. 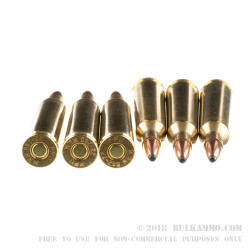 When this bullet hits a target, its soft point will cause it to mushroom out, controlled by its copper jacket, for damage guaranteed to drop varmints and small game. With its staggering muzzle velocity of 3674 fps, this cartridge even has the potential to take down a deer under the proper circumstances. All of Serbia-based Prvi Partizan’s cartridges are made with non-corrosive primers and factory fress brass casings. 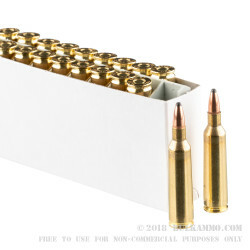 As such, this cartridge is fully reloadable, meaning that theoretically speaking this one box could last you for several hunts!